We curated and coordinated an art installation at the DIESEL POP UP STORE at Isetan collaborating with emerging artist Eugene Kangawa. KANGAWA’s beautiful video work is created based upon DIESEL’s latest collection theme “DIGITAL EXPLORER”, and also an another edition of his previous work, “i Emmigrant” which depicts ‘the dream of migrants’. This story of this film is composed based on the conversation with anEastern European migrant, Christopher and the mysterious fairy tale that he heard from his grandmother. We are very happy to participate in coming "Here is ZINE Tokyo" curated by Enlightenment. The venue is at TOKYO CULTuART by BEAMS in Harajuku starting from Nov. 13 to Dec.2. Jules Julien and Timothy Saccenti, and Woog from MW are also releasing their limited zine for exclusively this event. Only a few each! So better come and get them soon! The reception is on Nov. 13rd from 17pm. Please come stop by! Jules Julien coming up show "POUVOIRS"
Teaser video for coming exhibition for Jules Julien. Opening is TOMORROW, June 5th, 2015! Congrats Julien! Amazing crazy pieces for Squarepusher directed by Timothy Saccenti. Upcoming show at Diesel Art Gallery! Ling Meng from Shanghai. We are so excited to announce our upcoming collaboration with Diesel Art Gallery featuring upcoming young creative from China, Ling Meng. SPECIMENS OF TIME -時間の標本- 2015. 3.06. - 2015. 5.22. The exhibition “ Specimens of time” features his entire collection of all the nature elements such as plants, flower, ore, and soil by his unique way of sampling to preserve “the moment” permanently. In this exhibition, on top of his previous typography and graphic design works, various specimens in mixed media and installation piece will be shown. More details are here. 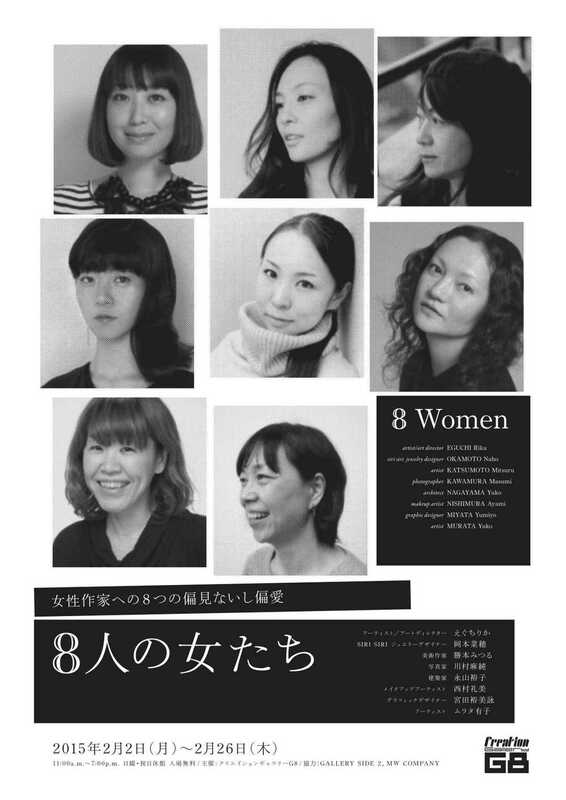 Currently, there is a group show of emerging young female creative from Japan called " 8 WOMEN（８人の女たち）" at Creation Gallery G8, Ginza, Tokyo. Exciting to see how beautiful and inspirational creation they showcase and We are very happy to be part of the show introducing our great friend from NY, Ayami Nishimura. The show is til 2/26/2015, Please visit. Jules Julien participated in new Apple campaign called "start something new". His artworks will be shown all the Apple store globally. Very exciting news! Women Will is a Google initiative dedicated to understanding the role of technology in women's lives and offering the tools, skills and opportunities to realize an exciting future. I was honored to be a part a part of it. Beautiful blue series collection by Jules Julien will be showing at Espai Tactel, in Spain. From November 14 - December 31 2014. Please check it out! Mogollon will have an art exhibition in IDOL, Aoyama, Tokyo. It is a part of the Australian singer song writer, Sui Zhen "Body Rest" Release party. Opening party is TONIGHT! November 8th from 8:30am - 2am. Please check it out! We are happy to announce that Mogollon, design studio from NY is now joining to MW Company. Welcome Mogollon! Looking forward to collaborate with you! Here is the latest project by Timothy Saccenti. Jules Julien's beautiful plaste collection has been just launched! The collection called "Collection Blanche" is now available at TH Manufacture. You can see a great mix of design product by various artists as well. We collaborated with well-known art collective Enlightenment to create the ad campaign for this year's Summer Sale in Roppongi Hills. The campaign includes posters, station ads, out of home, video loop as digital signage, and web banners. Have a great weekend!! Play now! Jules Julien is participating a group show "Super Human" at Plus Gallery, Denver US. Starting from July 10 to August 15. Jules Julien designed a portrait of founder and art director of Cole Haan. The portraits are up all their stores around the world. Christian Joy "Bok Joy Part Deux"
Christian Joy's new installation piece called "Bok Joy Part Deux" is exhibited at Anxious Space, Knockdown Center. This group exhibition introduces a new generation of artists who are based in New York. DIY guru Christian Joy installs larger-than-life, hanging soft sculptures in Knockdown’s gallery space. Inspired by kids’ bop bags, these “characters” are constructed from vibrantly colored fabrics and incorporate textile designs. The exhibition is from June 16 - July 15, 2014. If you visit Paris, you should get this amazing guide book CITIX 60 by Viction:ary. It is a collection of all the favorite spots recommended by 60 creative people in Paris. Jules Julien introduces his favorite places as well. Timothy Saccenti shot for upcoming the World Cup 2014 “Battlepack” campaign for Adidas, featuring portraits of over 60 players including Lionel Messi (Argentina), Luis Suarez (Uruguay), Oscar (Brazil), Dani Alves (Brazil) and Mesut Oezil (Germany). Adidas. Inspired by Timothy's immersive, monochromatic projection technique, had Timothy photograph the players around the world, projection mapping their individual designs onto them. The result is a series of boundary pushing, utterly unique portraits of the worlds top football players in Tim's laser focused dazzling style.